Disneyland Hotel historian Don Ballard has an amazing collection of photos from the decades when the Hotel was owned by Wrather Corporation. Don recently challenged me to use some of them for a “then & now” article. , Curator of Yesterland, October 2, 2015. 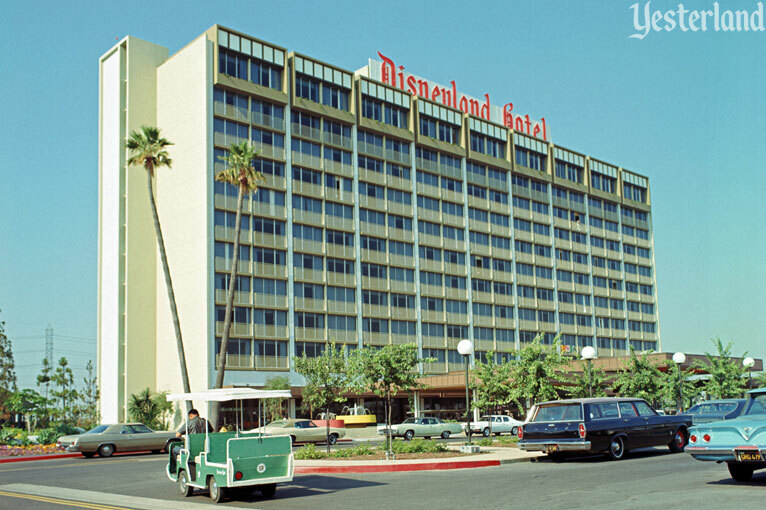 When the Disneyland hotel opened in 1955 with just seven rooms completed, the creative and entrepreneurial force behind it was Jack Wrather (1918-1984)—not Walt Disney. 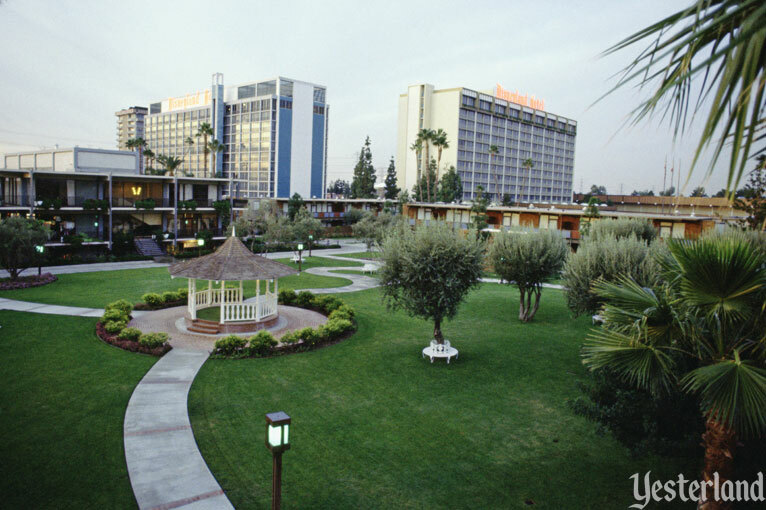 Wrather-Alvarez Hotels, Inc. built the hotel because Disneyland Inc. did not have the resources. In 1958, Wrather bought out his hotel business partner, Helen Alvarez. For the next 30 years the hotel would be owned by Wrather Corporation. The Walt Disney Company would not acquire it until 1988. 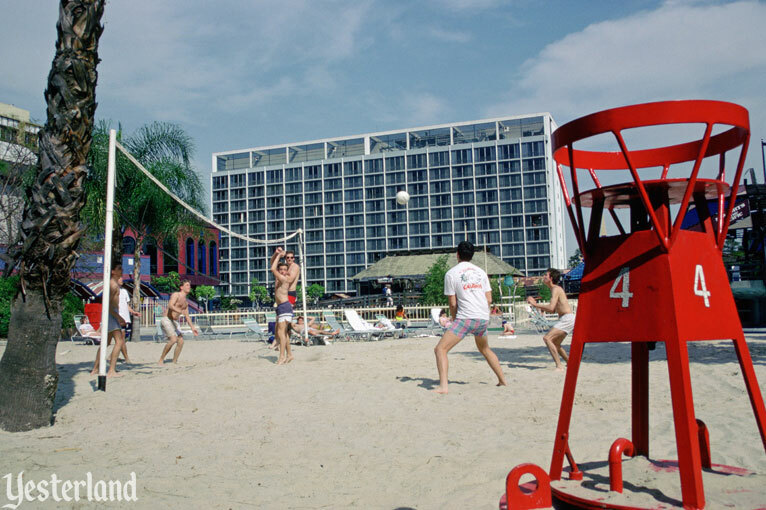 By then, it had become a sprawling 1,174-room resort with three towers, an inland marina, and its own convention center. 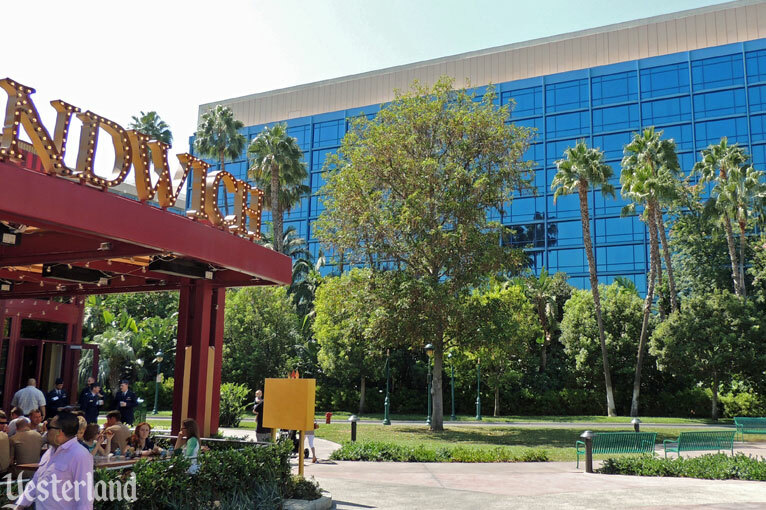 For the first decade of Disney ownership, changes to the Hotel were minor. The photos in this article compare photos from the Wrather era with how the same places appeared in September 2015. The towers that Wrather built are now the core of the Disneyland Hotel. Energy-efficient blue glass skins replaced the sliding glass doors and faux balconies in 2010. 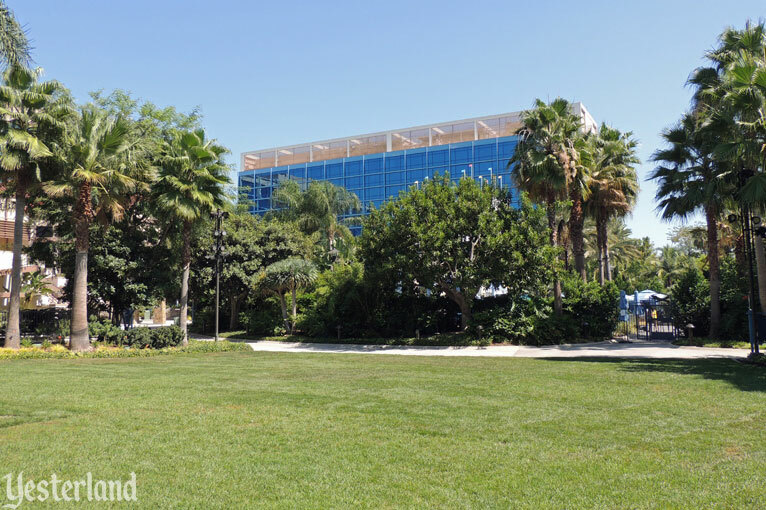 The spot that was once the heart of the Disneyland Hotel—the Olympic-size heated swimming pool—is no longer part of the Disneyland Hotel at all. The Hotel’s first tower opened in 1962 as the Tower Building—the first of four names. Its width and room-count doubled in 1966. Before the 1970 completion of a second tower at the Hotel, the Tower Building became Sierra Tower. It received its third name in 2007, Dreams Tower. 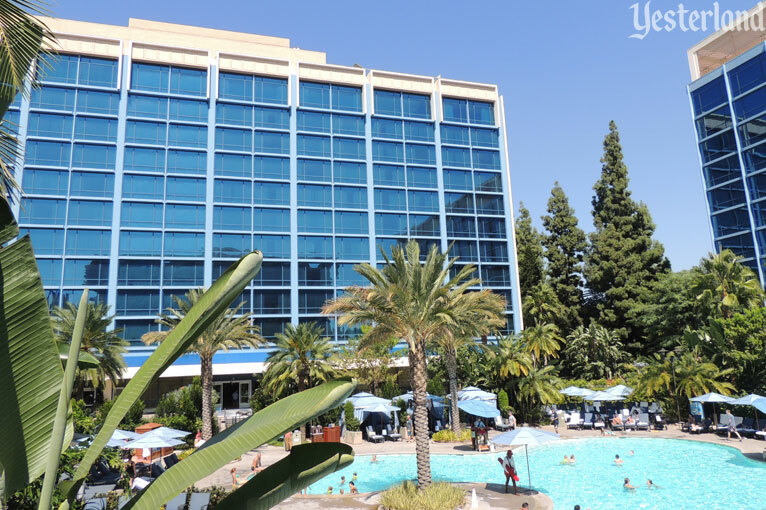 As part of the 2011 renovation of the Disneyland Hotel, it received its fourth and current name, Adventure Tower. 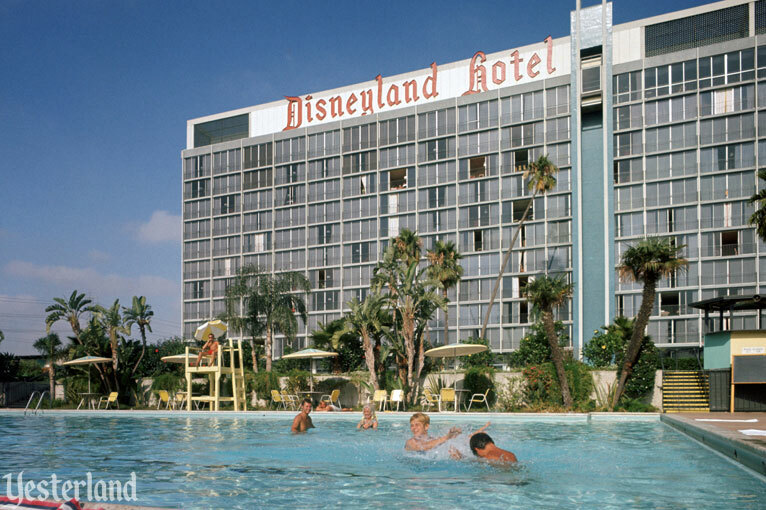 The Olympic swimming pool—and everything else at the Disneyland Hotel east of what was then the Sierra Tower—was demolished in 1999, eleven years after The Walt Disney Company acquired the Hotel. With a smaller Hotel footprint, Disney gained some of the space for the construction of Downtown Disney. The former beach is now a large event lawn for wedding receptions and other outdoor gatherings. 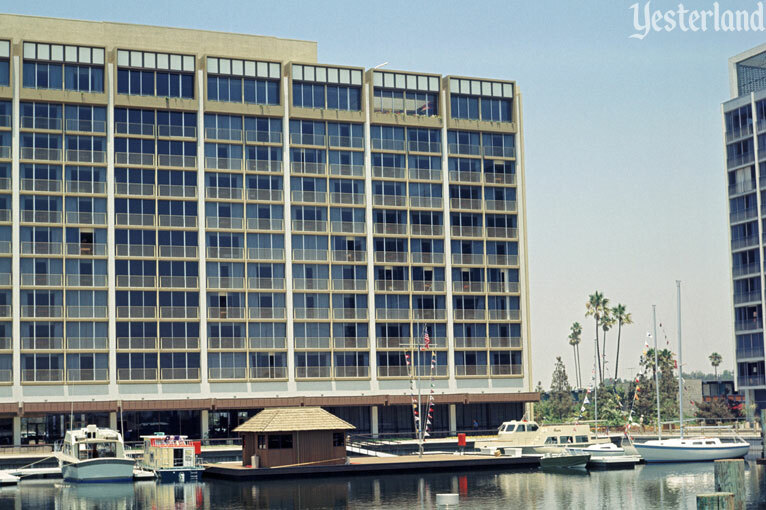 When the 11-story, 319-room Marina Tower opened in 1970, the Disneyland Hotel could boast 1,000 guest rooms and a new registration lobby on the ground floor of the new tower. 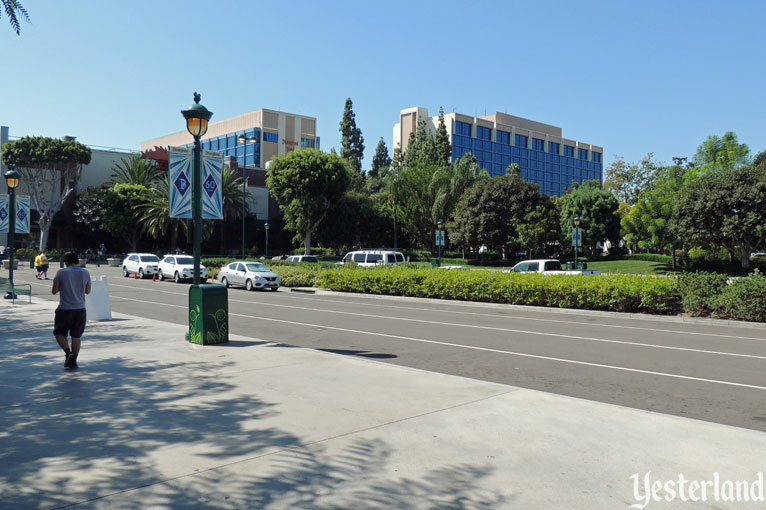 The large porte-cochère made it clear that the Hotel entrance had moved from West Street (now Disneyland Drive) to Cerritos Street (now Magic Way). Marina Tower has been the main entrance to the Diseyland Hotel ever since, although its name changed to Magic Tower in 2007 and to its current name, Fantasy Tower, in 2012. The tower almost wasn’t called Marina Tower. According to Don Ballard, “Originally, this new building was to have been named Cerritos Tower.” The north-facing rooms, on the Cerritos Street side, offered views of the mountains. The south-facing rooms overlooked the Hotel’s new inland Marina. And that provided a better name for the tower. When the Hotel’s footprint shrank in 1999, it lost its Olympic swimming pool. The space that had been the Marina became home to the Never Land Pool. In 2011, the Never Land Pool was replaced by the E-Ticket Pool, D-Ticket Pool, and Monorail Pool. 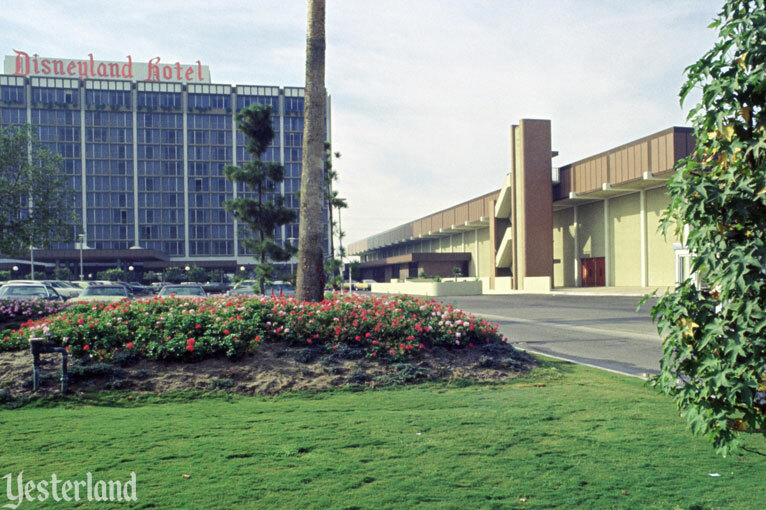 In 1967, the City of Anaheim opened the Anaheim Convention Center south of Disneyland. In 1972, Jack Wrather opened his hotel’s own $7.2-million Convention Center, with a 30-thousand-square-foot Exhibition Hall and 20-thousand-square-foot Grand Ballroom. 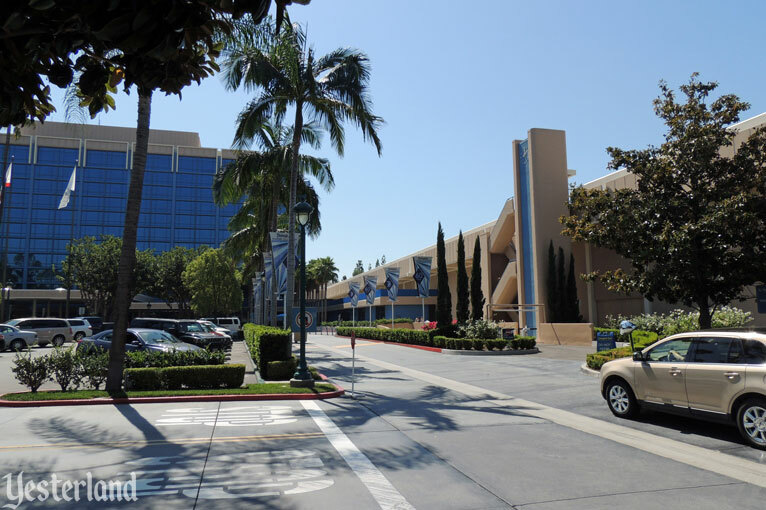 The Convention Center continues to be an integral part of today’s Disneyland Hotel. 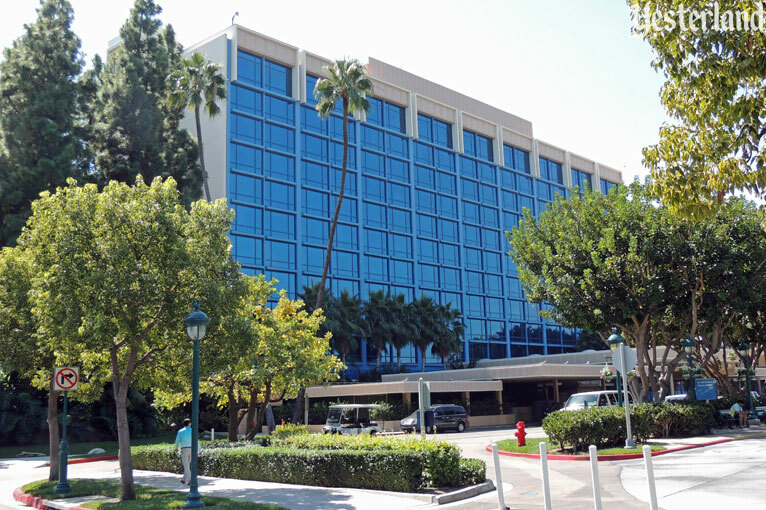 The third tower at the Disneyland Hotel opened as Bonita Tower in 1978. It was named after Bonita Granville Wrather—actress, Jack Wrather’s wife for 37 years, and chairman of Wrather Corporation after his death in 1984. As with the other two towers, its name changed twice under Disney ownership—first to Wonder Tower and then to Frontier Tower. 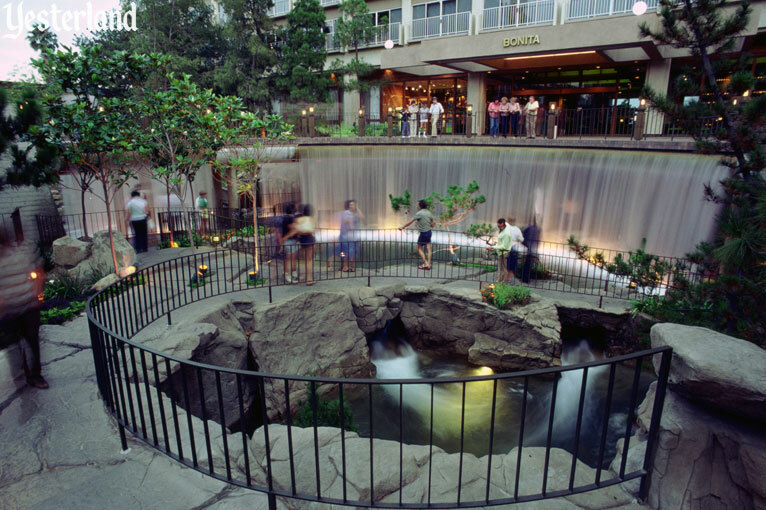 Located at the opposite end of the Marina from Marina Tower, Water Wonderland opened in 1979 with the Aqua Gardens and 165-foot-wide Horseshoe Falls. Horseshoe Falls was demolished in 2010. It was replaced by gardens and an event lawn called Frontier Lawn. 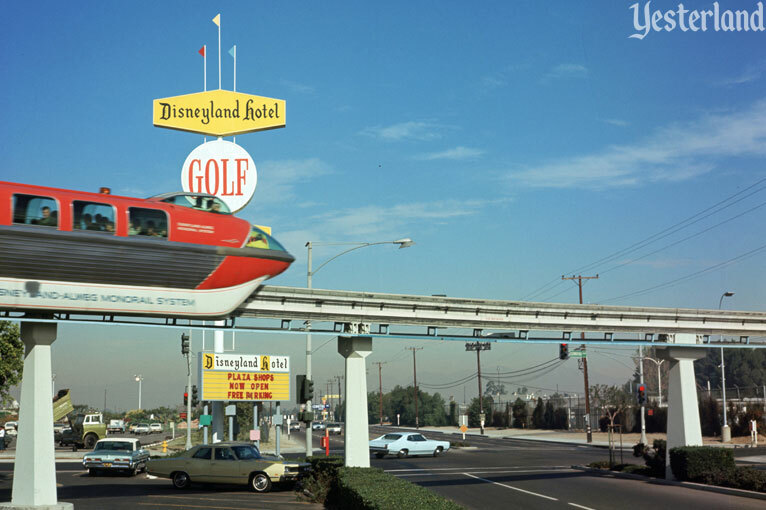 Guests ask, “Why did they move the Monorail station that served the Disneyland Hotel?” The answer is that it didn’t move at all. At the Hotel end, the beam still follows the same path as in 1961 when the Monorail extension opened. The parts of the Hotel near the station were demolished and the station was redesigned. West Street is now called Disneyland Drive as it passes the Hotel. 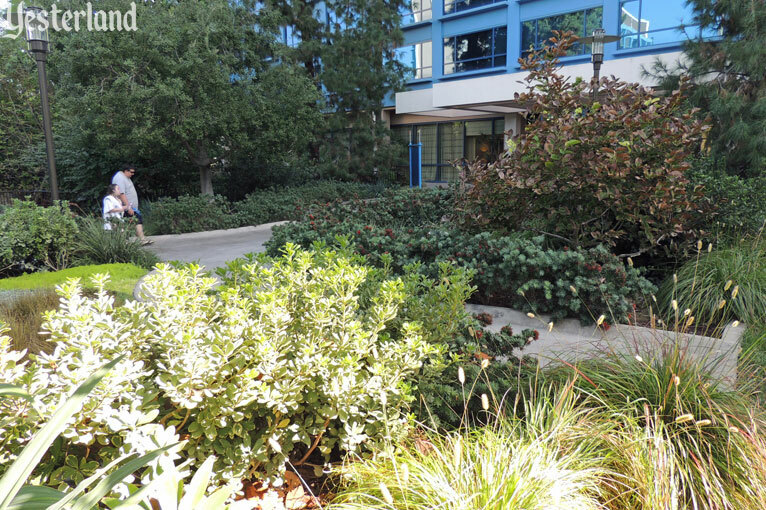 Transforming Disneyland’s neighborhood from an asphalt suburb to an “urban destination resort” in the late 1990s included planting several thousand palms along the streets. 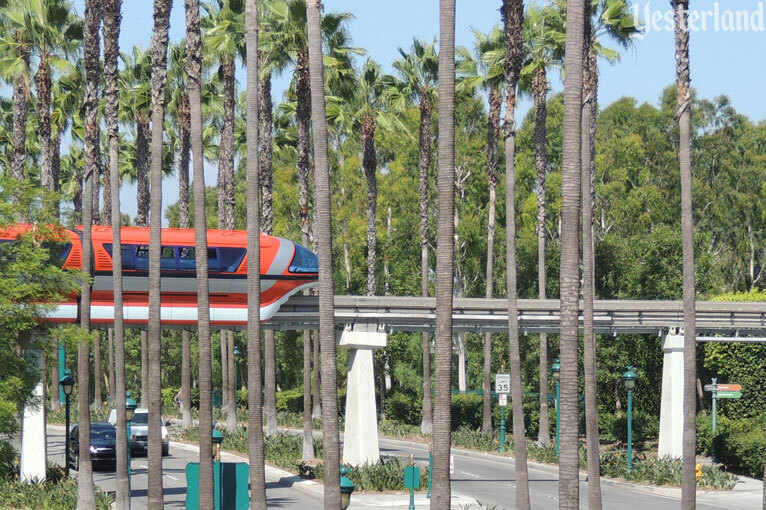 The pair of photos above shows the Monorail crossing the street adjacent to the Hotel at the same spot. The pylons are the same pylons. In the “then” photo, the median is on the right. In the “now” photo, the same pylon is in the center, also rising from the median. Thank you to Don Ballard for the historical images of the Disneyland Hotel and his assistance with this article. To see rare historical photos of the Disneyland Hotel and to learn more about these books (including how to buy), visit www.MagicalHotel.com.